According to USAToday, heavyweights Travis Browne (Pictured) and Antonio ‘Bigfoot’ Silva will headline “UFC on FX 5.” The October 5th event, which was originally slated to take place September 7th in Indiana, goes down inside Target Center in Minneapolis, Minnesota. 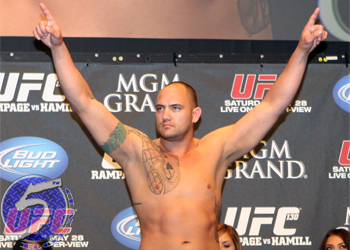 Speaking of switcheroos, Browne was initially slotted to fight Ben Rothwell next Saturday at “UFC on FOX 4.” However, an ankle injury forced Rothwell out and the organization opted to pull Browne from the lineup instead of scouring their roster for a last-minute replacement. Browne continued his torrid ascent up the totem pole with an easy submission win over Chad Griggs at UFC 145. “Hapa” is unbeaten in 14 professional bouts, although he did post a draw against Cheick Kongo at UFC 120. This shootout marks Silva’s second Octagon foray. The Brazilian was blasted by Cain Velasquez in his big league debut at UFC 146. The UFC has not taken their talents to Minneapolis since UFC 87 in August of 2008.